The Belgian Sheepdog, known as the Belgian Groenendael in other parts of the world, originated in the late 1800s by a group of people who gathered stock dogs from around several areas of Belgium. 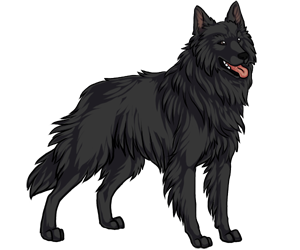 While the UKC recognizes all four varieties of the belgian shepherd, Tervuren, Groenendael, Malinois, and Laekenois, as the same breed, the AKC recognizes them all, with the exception of the unrecognized Laekenois, as seperate breeds. Today, all varieties are used as working and companion dogs. The Belgian Sheepdog (Groenendael) is the most common of the Belgian breeds. The Belgian Sheepdog is a relatively healthy breed with only minor health concerns including allergies, epilepsy, and excessive shyness or aggressiveness.